In this eBook, uncover how companies are looking to tap into real-time analytics to help speed up the business decision-making process. 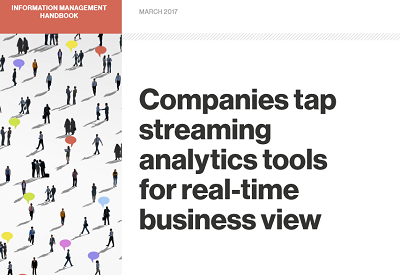 Companies Tap Streaming Analytics Tools for Real-Time Business View. One of the growing uses for big data platforms is capturing streams of data that are continuously ingested, processed, stored and analyzed. IT vendors increasingly are releasing technologies that facilitate the real-time streaming analytics process. Explore how you can organize the methods by which streaming data is forwarded to an analytics system in a way that preserves the integrity of the operational events generating the data, and more.